In partnership with the Hawai‘i Department of Health. The Choose Healthy Now (CHN) program aims to increase awareness and availability of healthier foods and beverages, giving people across the state more opportunities to eat well! 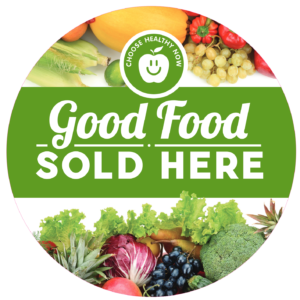 CHN enables participating retail venues and worksite snack shops to easily promote healthy products through signage, product placement, and price incentives. Just look for our logo to find items that keep you and your family happy and healthy! To find all Choose Healthy Now locations and videos, visit www.ChooseHealthyNowHawaii.com. Download Free Choose Healthy Now materials for your business or worksite. Choose from a wide array of FREE Choose Healthy Now downloads, including: posters, window clings, floor clings, point-of-decision prompts, and more.